Tampa is within 20 minutes of some of the nation's best beaches. Editor's note: This piece is part of a series of "city smackdowns" pitting rival cities against each other and letting you decide which one's best. This week the political convention cities go head to head. On Tuesday, we heard about the virtues of Charlotte, N.C. Vote for your favorite in the poll below, then visit CNN iReport to defend Tampa or Charlotte. (CNN) -- Florida has become known for the weird. Highly charged court cases, nudist colonies and a bounty of tanning salons seem to arise in the Sunshine State. And unfortunately, cut-off jeans and flip-flops are not in short supply here. But in the midst of the humidity and sunburned tourists, you'll find Tampa. Yes, you will still find humidity and sunburned tourists, but also a diverse Tampa Bay area community that includes Greeks, Cubans and Scientologists. The area consists of the cities surrounding Tampa Bay. Four bridges cross this large expanse of water linking the bay area together. As the signs warn you, check for gas before you drive across the three-mile Howard Frankland Bridge. With miles of open water on both sides and pelicans flying by, it's hard to find a better commute. In the summer of '97, I moved with my family to the Tampa Bay area from Georgia. "We live where people vacation," my mom loved to say. My parents bought a house with a pool in which we swam every day after school. We met Dad at the beach after work for dinner where we lost a sandwich here and there to a few daring seagulls. Tampa's great weather made all of this possible. As I've traveled around America's peninsula, I've noticed that compared with other Sunshine State destinations, Tampa's climate is superior. The breeze coming off the bay cools everything down. Yes, it's hot, but the light wind makes it bearable, and in the winter, there are never more than three weeks of uncomfortable cold. Many winters you'll find yourself on the beach and even in the water as late as October. (Take that, landlocked Charlotte). In downtown Tampa, the Hillsborough River carries diverse creatures from manatees to rowers through a collection of old factories and new office buildings. Along the winding river, the onion dome-topped buildings at the University of Tampa add to the unusual skyline. The campus was originally a grand hotel built by the railroad mogul Henry B. Plant, who saw an opportunity in Tampa with its central location in Florida and scenic landscapes. 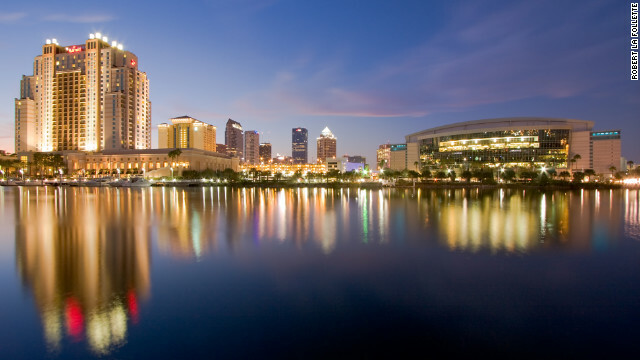 Follow the Hillsborough River out of the city, and you'll quickly find Tampa's natural beauty. The placid waters make for an extremely relaxing canoe trip. The low hanging trees create a beautiful canopy along the river, and the surrounding trails offer perfect weekend escapes for hikers. The river is just the beginning of Tampa's aquatic allure. Tampa is less than 20 minutes from some of the best beaches in the country. Whether you spend the day sipping daiquiris on the more commercialized beaches in Clearwater or travel south to the quieter Fort De Soto Beach, you'll be blown away by the white sandy shores and warm water. Just don't forget to do the stingray shuffle as you wade into the surf. Back on shore, the Gasparilla Pirate Festival is an annual event not to be missed. At the end of January, locals and tourists take out their finest eyepatches and polish their hooks in an event named after the swashbuckling pirate Jose Gaspar, who prowled the waters off the state's western coast during the late 18th and early 19th centuries. While hundreds of boats clog the waterways surrounding downtown Tampa, thousands of people enjoy a parade on land. I hear a little drinking goes on too. There's no need to drive all the way to Orlando for Disney when Tampa is home to one of Florida's greatest theme parks. Busch Gardens has a large variety of roller coasters and other stomach-churning rides. For those less-daring patrons, this African-themed park has a multitude of exotic animals. My favorite stop is always the giraffes on the Serengeti. The Tampa Bay area is home to many diverse communities. In Ybor (that's pronounced E-bor), an old cigar factory community with Spanish, Cuban and Italian roots, you can watch cigar rollers' tobacco-stained hands quickly assemble cigar after cigar. More importantly, you may sample a Cuban sandwich. The popular Columbia Restaurant, founded in 1905 by a Cuban immigrant, attracts locals and tourists with flamenco dancers and authentic Spanish food. Traveling west, you'll find Tarpon Springs, where you can watch divers unload natural sea sponges from their boats and enjoy the Greek pastries and cuisine first brought to town by the community's early residents. Or head south and stroll through charming downtown Dunedin, a small town with a rich Scottish background where you might catch a bagpipe performance by Dunedin High School's band. Even Tom Cruise finds himself in the Tampa Bay area, as downtown Clearwater is the spiritual headquarters of Scientology. For a peek at surrealism, head to the Dali Museum in neighboring St. Petersburg to see the largest collection of Spanish artist Salvador Dali's work outside of Spain. Tampa's interesting mix of people has not gone unnoticed. While the majority of Florida votes Republican, Tampa, along with Miami and Orlando, is going to be one of Florida's few deciding factors in this year's election. The entire area is buzzing with anticipation for those days in August when the Republican National Convention will draw America's attention to Tampa.